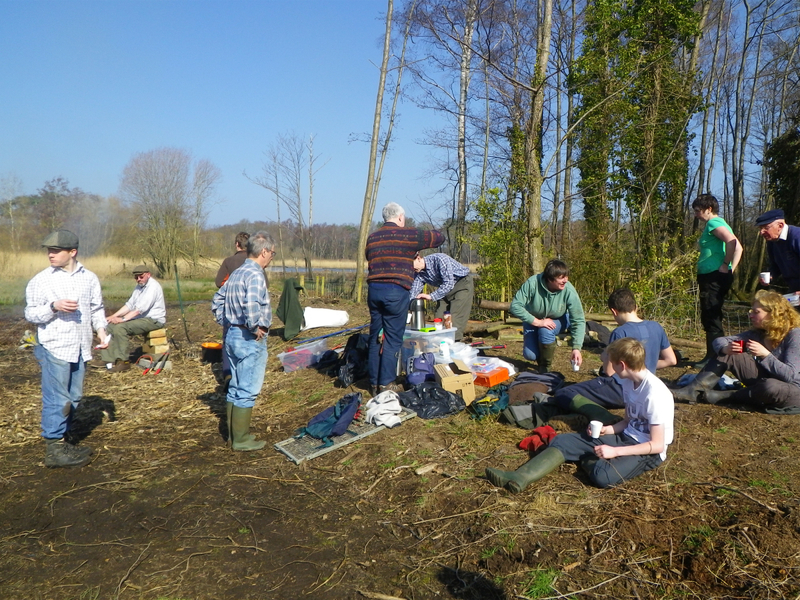 “Another great turn out for the Fleet Pond Society Volunteer March Sunday! Wow what amazing weather! We were all rewarded with Brimstone and Peacock butterflies, and we counted up to 15 Herons flying over the Islands! 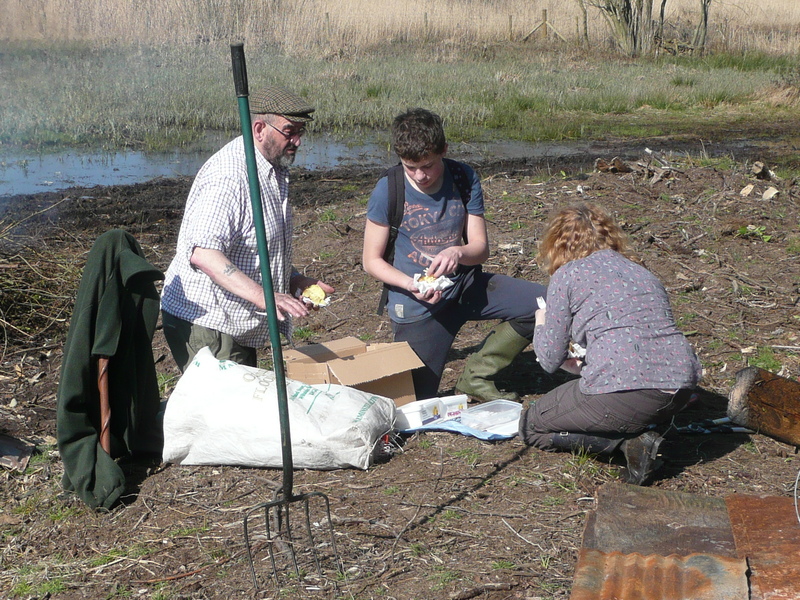 The aim was to clear as much brash as possible from along the footpaths at Fleet Pond. These extra branches and logs were from the recent storms and previous volunteer parties. With the logs, the team made log piles in the woods which will be valuable dead wood for insects. The brash was pulled out of the Eastern marsh now thankfully the area is just about dry enough to venture out there! Terry and Nick worked on the view point and it’s looking great! There was lots of interest from passers by. We have a team out on Fugelemere Marsh burning all the brash, some dragged from the marsh and some from nearby footpaths. 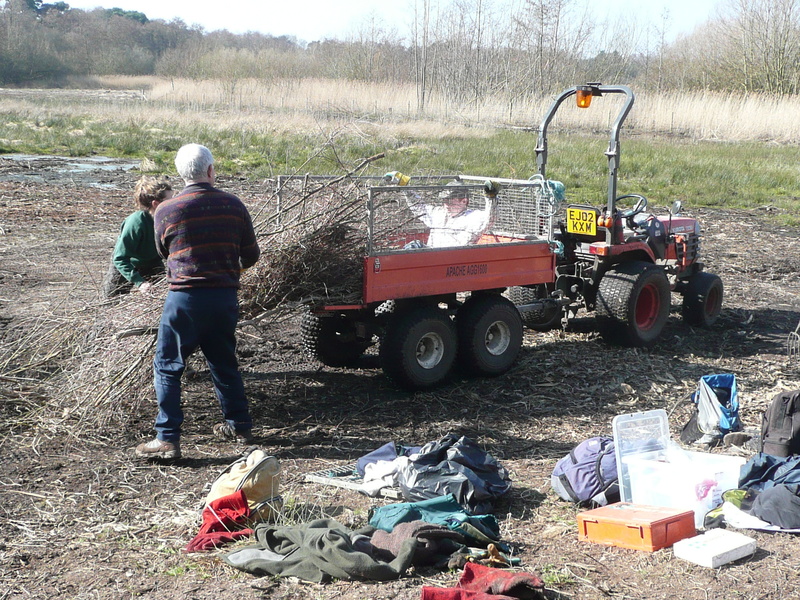 We also reduced the huge pile off the dry heath. 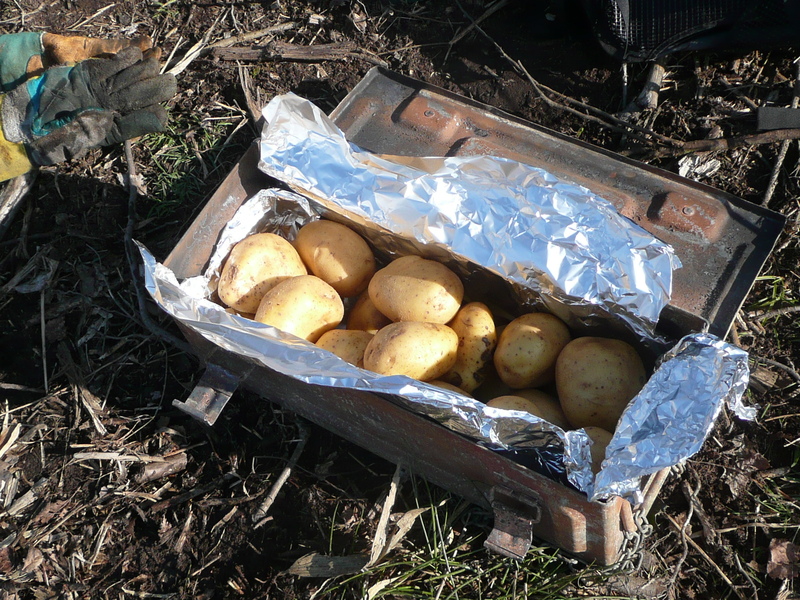 Well, that’s one way to get the job done! Ed. 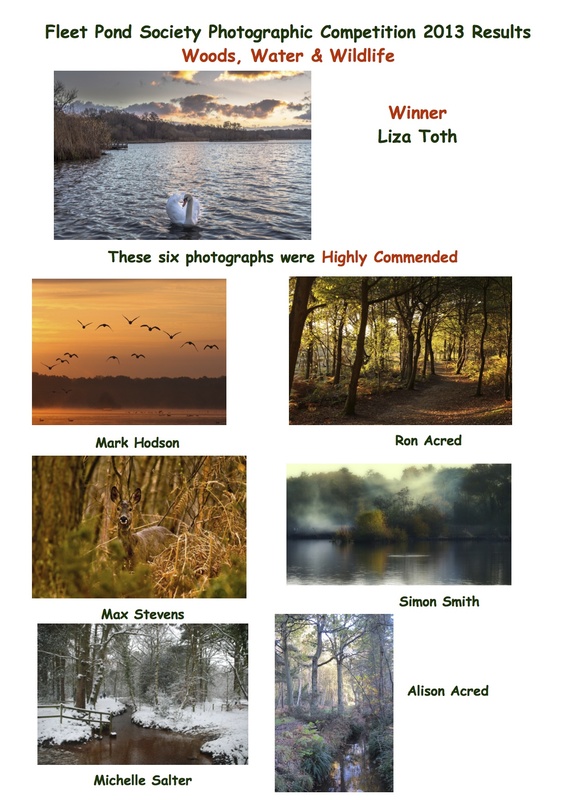 Some excellent pictures of herons at Fleet Pond can be seen on the Fleet Pond Society Group Pool on Flickr – see here. Ed. If you are interested in the butterflies that can be seen at the Pond (as mentioned above), why not take a look at these articles by Peter Martin? Butterflies Around The Pond – Have You Seen Any? Photo credits: David Pottinger and Rachel Jones. Michelle Salter, Secretary of Fleet Pond Society, has previously written a very interesting series of articles on some of the wildflowers that can seen at Fleet Pond during the spring and summer months. They all contain original photography as well as illuminating background information. 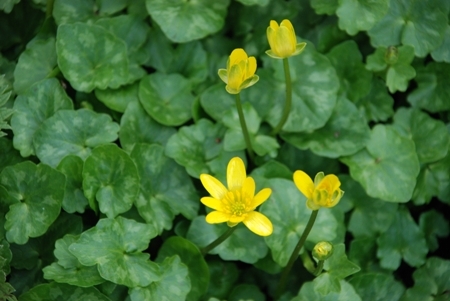 Why not keep an eye out for some of these flowers when you next take a walk around the Pond? Fleet Pond Society are thrilled that their Vice Chairman, Terry Austin, has been the recipient of the Hampshire High Sheriff’s Community Award for North East Hampshire. This prestigious award is given to members of the community who deserve special recognition for their community activities. Terry is a tireless worker for the Pond, responsible for the planning and implementation of several innovations such as the Fleet Pond Clearwater Campaign DVD, Kenilworth Road boat launching platform, the dipping platform at The Flash and the History Board and leaflet amongst a myriad of other projects. 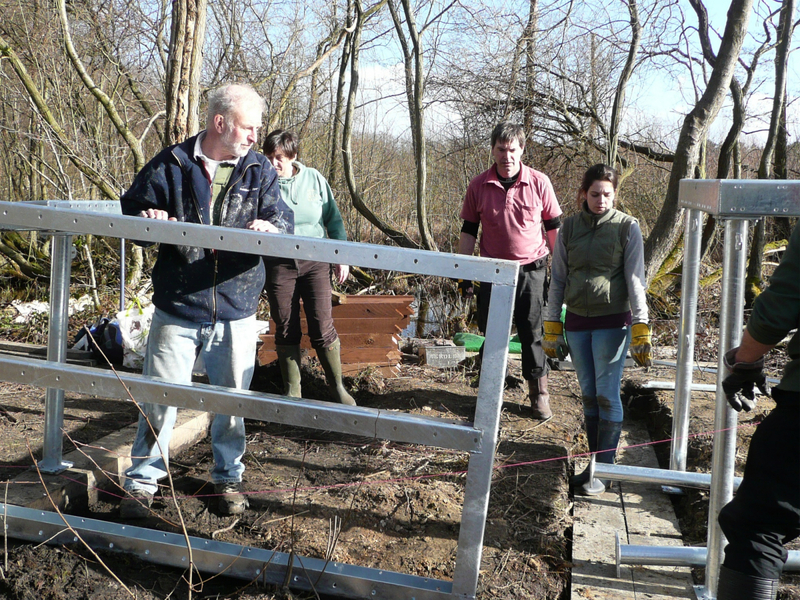 He also leads the ‘Last of the Summer Wine’ team of volunteers on a Friday morning; this team, nicknamed because several of them are retired, complete numerous jobs to help keep Fleet Pond and its surrounding Nature Reserve a site of great benefit to the local community. 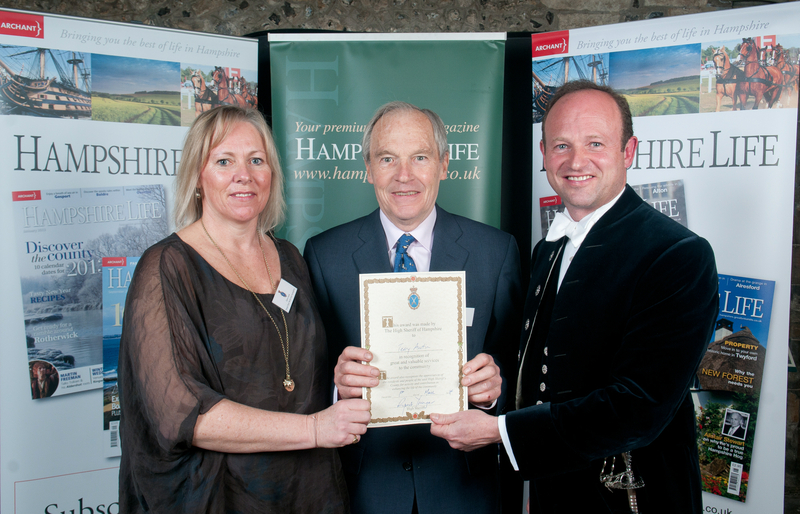 Terry is pictured with his award, alongside Rupert Younger, High Sheriff of Hampshire, and Claire Lloyd, the Award Panel Chair for North East Hampshire. The ceremony took place recently in the historic atmosphere of the Great Hall at Winchester, where the winners and their guests enjoyed a champagne reception in the shadow of King Arthur’s Round Table. 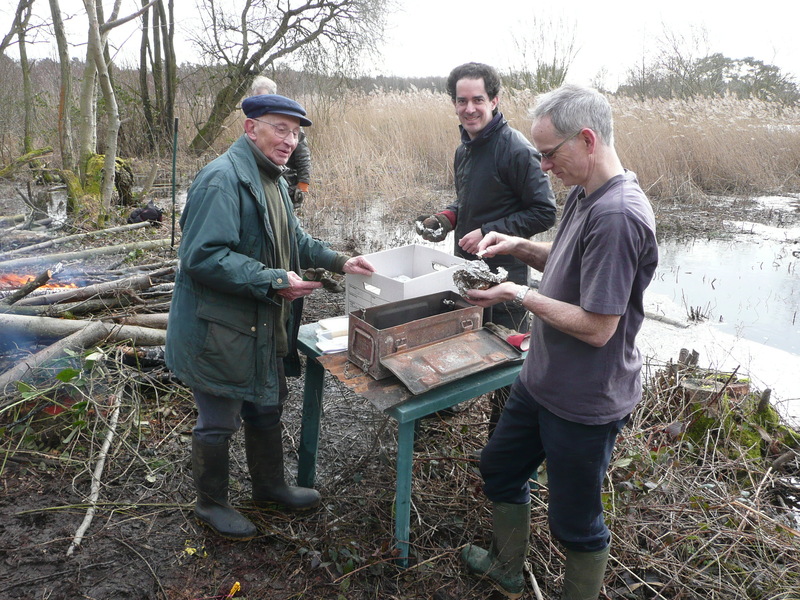 The High Sheriff and his team visited Fleet Pond on one of the wettest days in February and Terry gave them a tour and updated them on the Pond Restoration project. Photo credit: Jason Allen, courtesy of Hampshire Life. Ed. 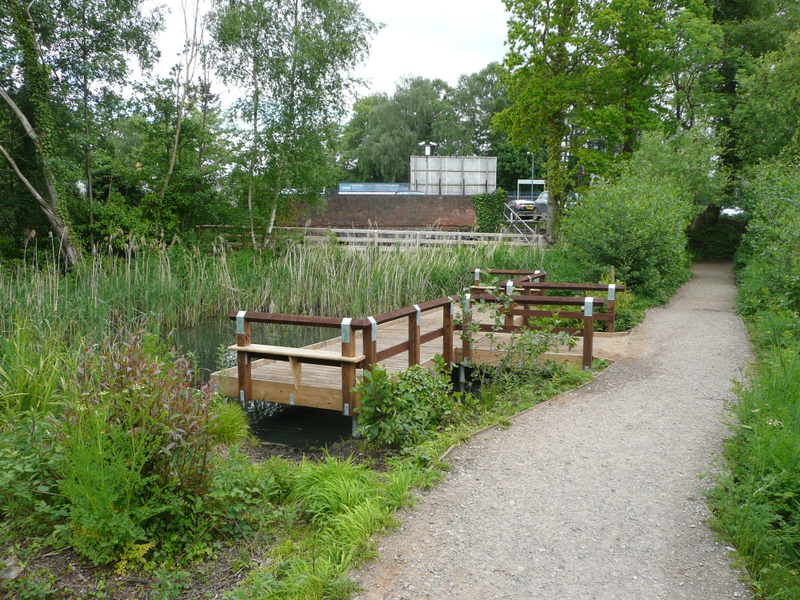 Further information on Terry’s impressive achievements at Fleet Pond can be found here. Phill Gower, the recipient of the Chairman of Hart District Council’s Award for Fleet Pond Society’s ‘Volunteer of the Year’ has been a long term supporter of Fleet Pond Society. Phill is Managing Director of local business Cove Industries, and his work behind the scenes at Fleet Pond, through the generous donation of his time and expertise, has enabled many important projects to come from the drawing board to fruition. 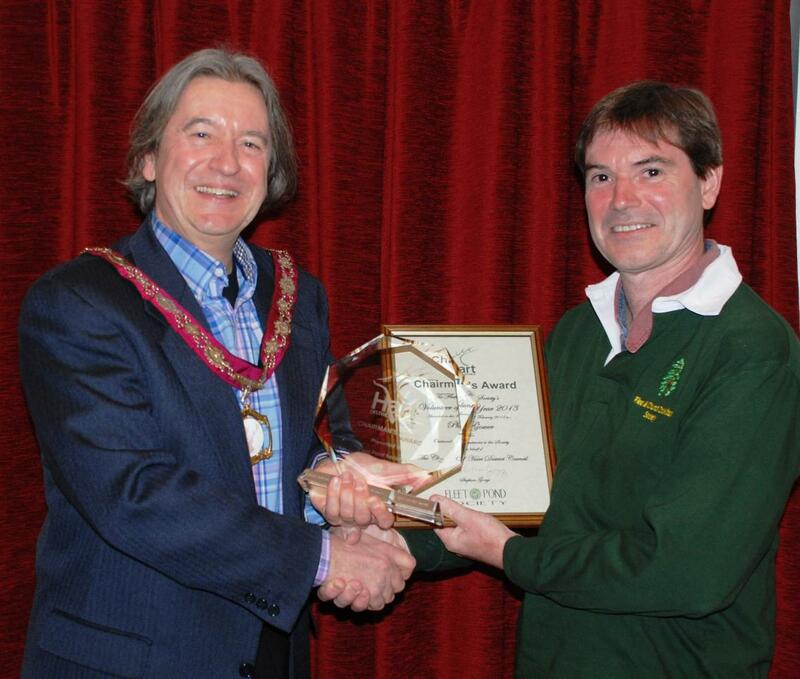 Phill was presented with his Award by Hart District Council Chairman, Stephen Gorys at the Society’s recent AGM (see picture above). 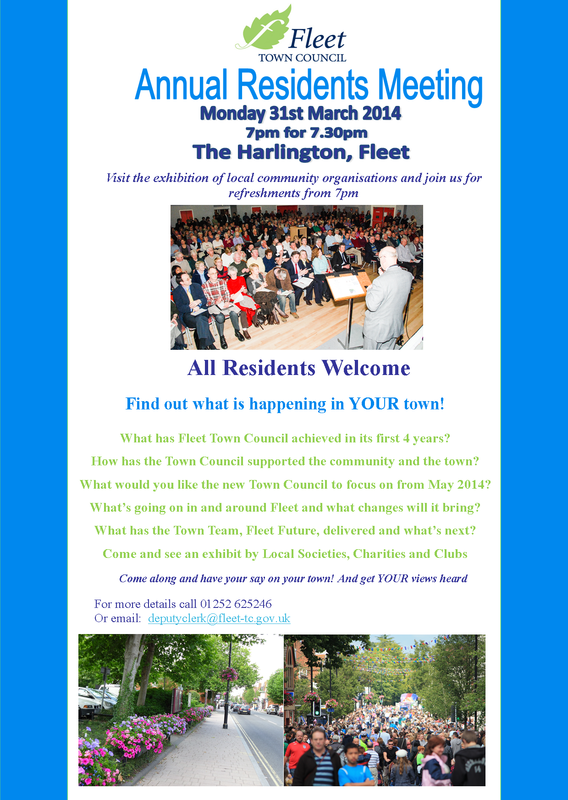 The Executive Committee of Fleet Pond Society gave a lot of thought to who was the most deserving person to receive this Chairman’s award. 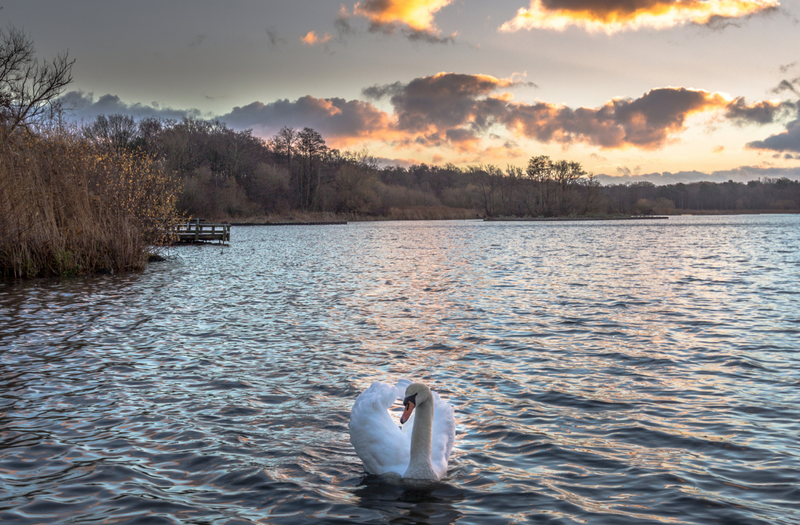 The committee wanted to recognise a person who has given most help and support to the Society and whose work has provided the most benefit to the nature reserve and to the many people who enjoy its peace, tranquillity and wildlife experience. 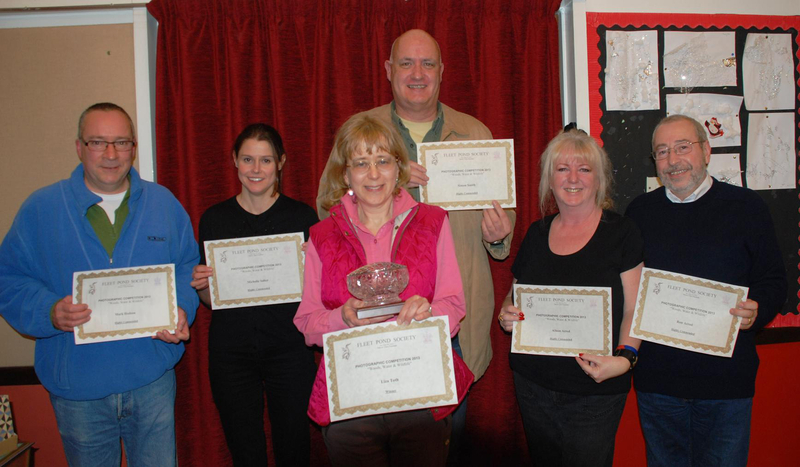 Phill’s community contribution does not end with Fleet Pond he also provides voluntary support to Fleet Lions, Fleet and Church Crookham Society and Fleet Town Council. Photo credits: Michelle Salter (top) and David Pottinger. Rather than reproduce the photos on the blog directly, it’s better to see them as an impressive slideshow via Get Hampshire: see here. There’s a summary poster below. 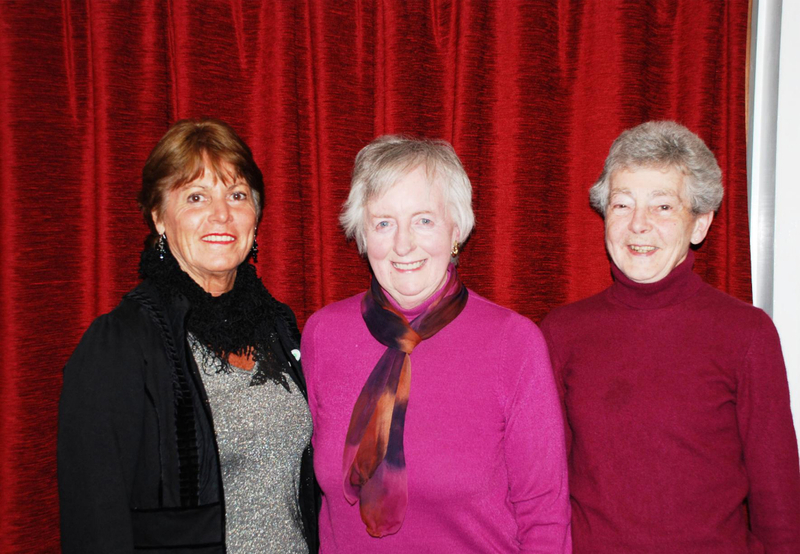 “Fleet Morning Townswomen’s Guild is part of a wider network of Guilds within the Hampshire North area, and operates under the National Townswomen umbrella. 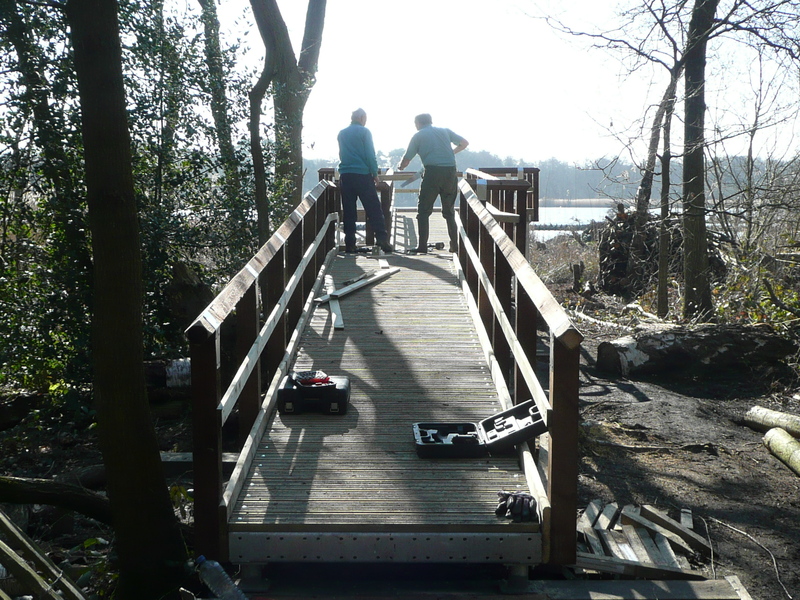 For many years the Guild has undertaken fund-raising for charity as part of its activities, and was delighted to support the appeal for the construction of a dipping platform at Fleet Pond. I am told that this was the second highest amount raised within the Guild, and the Fleet Morning Townswomen’s Guild dipping platform is now resplendent in The Flash between Hemelite Bay and the station car park (see picture below). At the FPS AGM, Barbara Billinge, Nancy Sparrow and Vivien Shoesmith of the Townswomen’s Guild (see picture above) presented the six Highly Commended certificates, and the Rose Bowl prize for the Best Photograph. The Rose Bowl is an annual presentation that was donated by Fleet Photographic. Once again, if you’ve not done so already, it’s well worth having a look at the impressive slideshow of the winning entries! See here. “As the Dry Heath fire site is still flooded I have set up a fire site on Fugelmere Marsh (by Sandy Bay). There are plenty of branches to clear nearby as well as further away for those that want to stretch their legs and follow the tractor! See you all at the workshop for 9:15 am, we will not have the Dry Heath as our base, but Fugelmere instead. If there are any major changes to the weather, this task may of course need to be modified. If you are in any doubt, please contact Hart Countryside Services (details below). Why not come along for some fresh air and exercise, as well as having the nice feeling that you’re doing something really useful for the community? To get a flavour of these volunteering activities, please read about the previous task here (see also picture above). 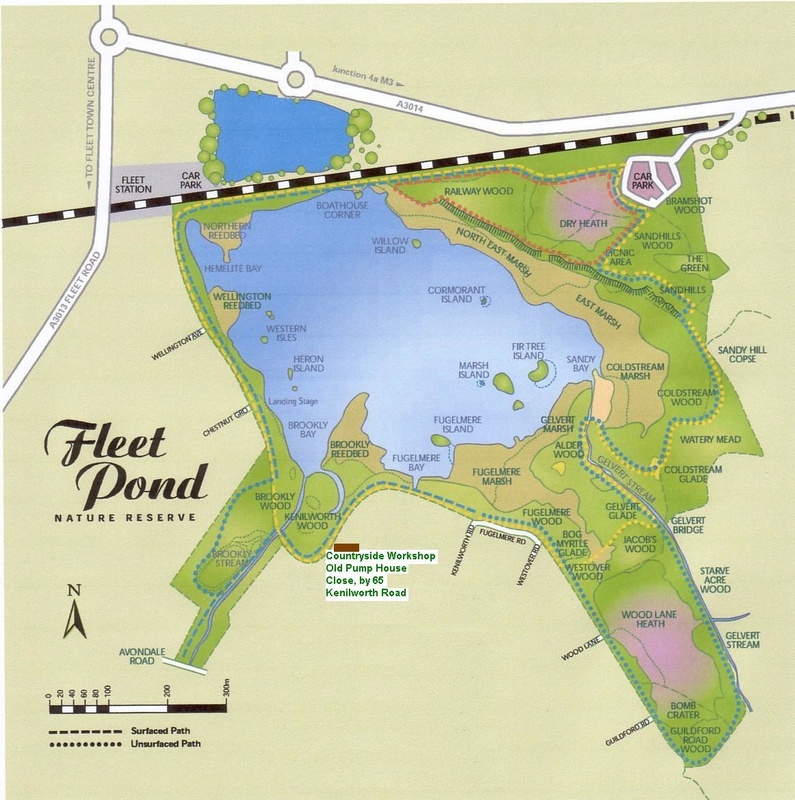 You are currently browsing the Fleet Pond Blog blog archives for March, 2014.